Cranberry Hummus Dip is a no cooking, 10-minute gluten-and-dairy-free vegetarian appetizer served with pita chips and crudité vegetables. It’s perfect for the holiday season! Thanks to Holland House Cooking Wine for Sponsoring this post! The holiday season is on! Along with it comes holiday food, and the best dishes are easy to prepare yet tasty, agree?! This 10-minute Cranberry Hummus Dip served with Pita Chips and Crudité Vegetables will blow your mind. It’s naturally gluten-free, vegetarian, festive, and requires no cooking. It’s a fool-proof holiday hit! Are you excited? Our Cranberry Hummus Dip follows the same concept as the classic gluten-free Levantine cuisine dip or spread prepared with garbanzo beans. It is made with canned chickpeas, tahini (sesame seed) paste, seasonings, sugar, garlic, and olive oil. 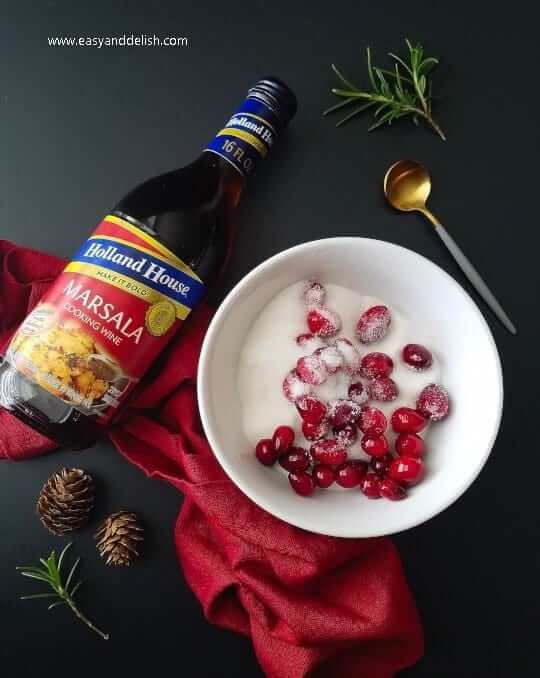 The addition of canned cranberry sauce and use of Holland House Marsala Cooking Wine instead of lemon juice are a couple of flavor-boosting twists on the classic recipe! 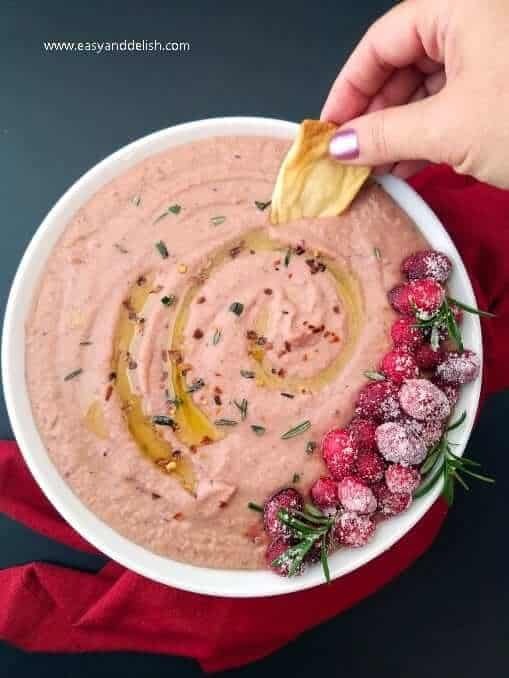 The appetizer is garnished with frozen cranberries and fresh rosemary to give the dip a warm holiday touch, while adding a sweet-sour flavor that contrasts so well with the savory taste of the hummus. … which, by the way, has a smooth, well-rounded, sweet wine taste with a hint of hazelnut that is versatile and ideal for cooking beef, chicken and pork. For an adventurous flavor-boost, add two tablespoons of Marsala cooking wine to your favorite meat dish for some amazing flavor. 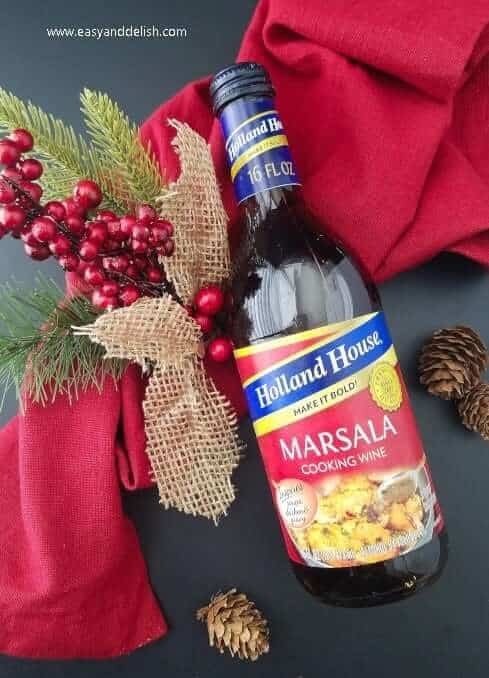 Actually, Holland House Cooking Wines are available in five versatile and flavor-boosting varieties – Marsala, Sherry, White, Red and White with Lemon. Each provides extra zing for a variety of everyday dishes, such as slow cooker and vegetarian dishes, soups, and cold-weather favorites, as the flavors hold up in high heat. And what’s more, they easily deliver a sensational boost of flavor to comforting holiday recipes, giving any dish an instant upgrade. Ready to prepare our yummy dip? 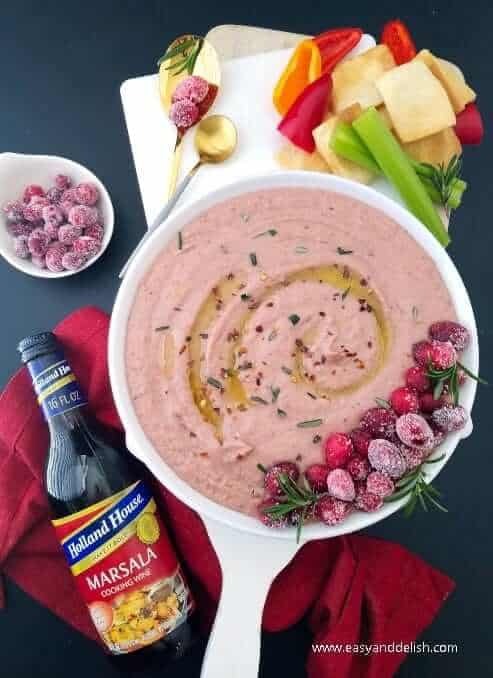 To prepare our cranberry hummus dip, blend canned chickpeas and cranberry sauce, tahini paste (optional), garlic, salt, ground pepper, sugar, Holland House Marsala Cooking Wine, and olive oil in a blender until creamy and smooth. Then, place mixture into a serving bowl, drizzle a little bit of olive oil on top, and sprinkle on chopped rosemary. Serve with pita chips and crudité vegetables such as celery stalks and sweet peppers. Well, for tips and more delicious recipes like our Cranberry Hummus Dip, also follow Holland House on Facebook and Pinterest. In addition, visit the Holland House website to download a redeemable coupon for your next visit to the grocery store. 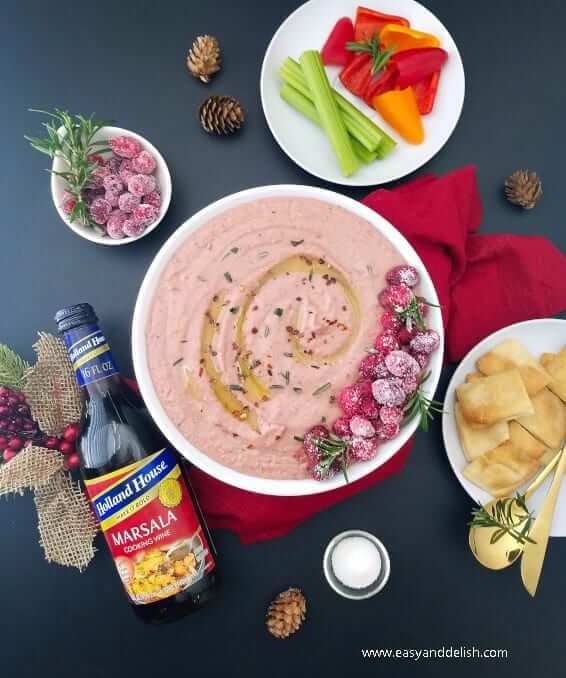 I hope you enjoy the best time of the year, along with our flavorful Cranberry Hummus Dip… and that you make great memories around the table with your family! If desired, add an extra holiday touch to this Cranberry Hummus Dip by garnishing with sugared cranberries. For this, combine 1/4 cup white granulated sugar and 1/4 cup water in a small saucepan over medium heat. Stir well until sugar dissolves ( about 1 1/2 to 3 minutes). Then, stir in 6-ounce fresh cranberries until well coated. Using a slotted spoon, transfer to wire rack; let dry for at least 1 hour. Working in batches, roll cranberries in 3/4 cup sugar until well coated; let dry for at least 1 hour. Cranberry Hummus Dip is a no cooking, 10-minute vegetarian appetizer served with pita chips and crudité vegetables. It’s perfect for the holiday season! Place all ingredients (but only 1 tsp of the rosemary) in a blender. Blend all until creamy and smooth. If necessary, add additional 1-2 tablespoons Marsala Wine to help blend mixture more easily. Then, spoon mixture into a serving bowl, drizzle a bit of olive oil on top, and sprinkle on remaining 1 teaspoon chopped rosemary. Serve with pita chips and crudité vegetables such as celery stalks and sweet peppers. Enjoy! Storage: Store hummus in a clean airtight container for up to 3 days in the refrigerator, or up to 6 months in the freezer. Don't let hummus sit more than 3-4 hours at room temperature. Leftovers can be used as a spread for sandwiches and roll ups, or as a filling for savory pastries. Hummus is a popular Middle Eastern dip/spread that is packed with vitamins and minerals. It is traditionally made with chickpeas, olive oil, tahini, lemon juice, garlic, salt, and pepper. 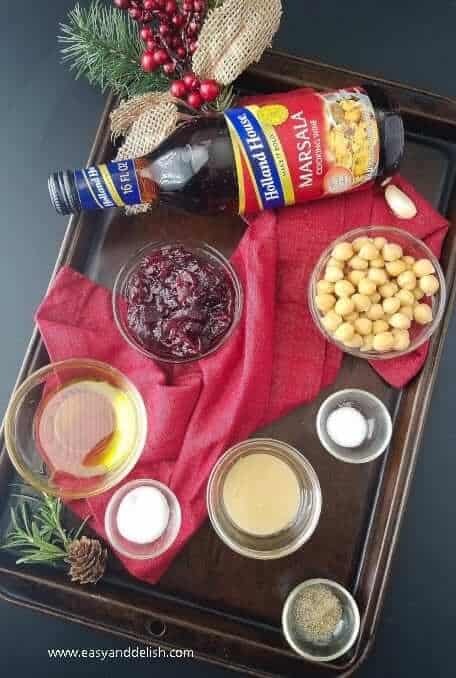 But our homemade holiday hummus replaces lemon juice with Marsala wine and adds canned cranberry sauce to the recipe. For sugared cranberries as an optional garnish, see recipe above (in the body of the post). 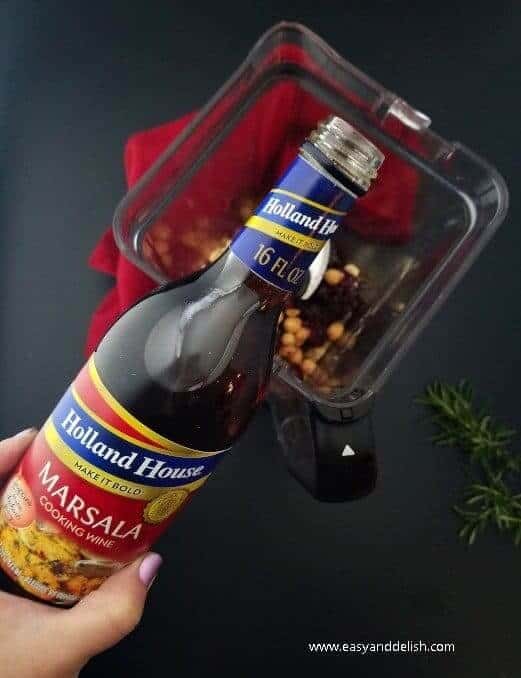 I’ve made a hummus with cranberry in it before, but never thought to add Marsala. I’ll have to try that! Neat idea — thanks. Thanks John! It gives extra flavor and a special touch to the dish.